Here is a manip I did for my good friend Enchantress over at marvel-boards.co.uk based on her description of her character in the new Nomads RPG we have going. Name: Sinistra Real name :Victoria Jean Essex. Here is Jaime Presley manipped. 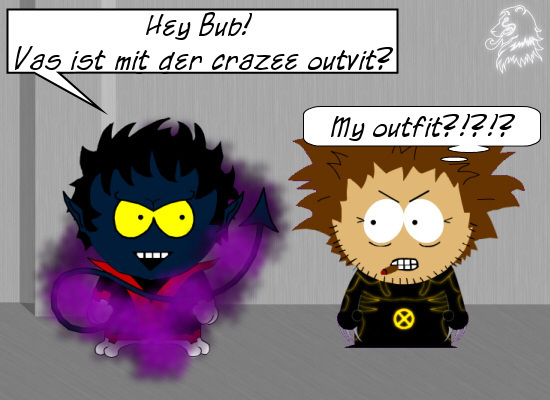 Costume is a more feminine version of Mr Sinister (Victoria’s father). Blended her existing bikini into a full body suit and adjusted the colors. The cape is created from multiple leather texture pieces rotated/skewed to give it more volume. Background created with multiple layers are with a DNA theme. Used this as practice for my big theme day submission. Look out tomorrow! EDIT: Made this the pre-preview for my ParkVengers Series.. I forgot to number this first one…or stick the title on it. Doh! Well I have had this kicking about for months.. but it has never seemed ‘finished’ – I think the coloring on the skin doesn’t look quite right, you know a bit flat. Base model is Kirsty Gallagher. Was wearing a black vest and pants. So to get the blue suit involved messing with the lightness and saturation. The 4 chest piece was done in vectors and is probably the part of this pic I am most proud of. If anyone can think of what this pic needs for some extra pizazz let me know..
Time for a change of pace with a quick LocalHero color/texture.. the pic is by Kevin Newburn (one of my fave amatuer artists). 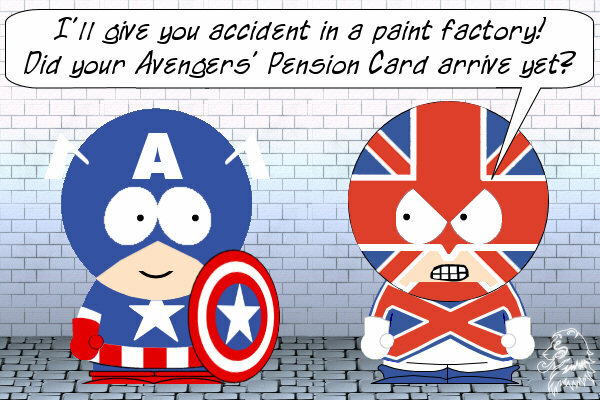 Here we see Tony explaining the various systems of a new armour to the rest of the Avengers (offscreen – lazy i know :p) I wanted to do a mix of animated style/real life action background and make them fit. 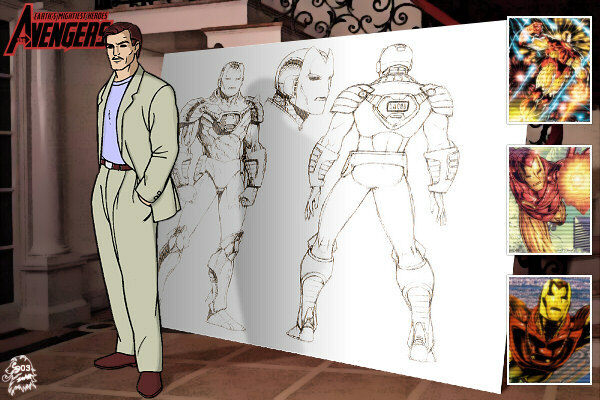 The Iron Man Sketchets and the base image for Tony were taken from various issues of Advanced Iron (check it out if you are an IM fan). I brought the sketches together on a new image and used deform and various gradient fills to get that ‘display board’ look. 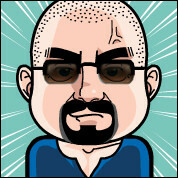 Tony is simply colored using blocks of colors that were darkened to indicate lighting and shadow. The drop shadow was done manually using Tony’s outline as a guide. as was the board shadow. The panels were found via a google search for this variation of the armour. I thought I would post an older pic. It never seemed quite finished somehow, but I can’t put my finger on what else it needs. Publicity shot from X2 of Yuriko aka Lady Deathstrike. I seem to recall I wanted to do one of those “Shadow reveals true self” sort of pics..
History: Clark was born to mutant parents, shortly before they were captured while travelling to northwards to the Canadian Border. Clark spent the early years of his life growing up in internment camps, learning to survive by running errands, always listening and learning. Seperated from his parents at the age of 13, Clark was transferred to the South Bronx Mutant Internment Center. Initially alone in the camp, which was much larger than any of the others where he had been detained, Clark began wandering the complex, learning all it’s secrets. This was a routine he had been through before many times in many camps. On one such expedition, Clark ran into an older boy, Franklin Richards and a pretty redhead named Rachel Summers, who took it upon themselves to look out for Clark. It was through Franklin and Rachel that Clark came to meet and befriend the men and women who’s selfless act would be the catalyst for his later life. Piotr Rasputin, a gentle russian giant with a talent for story telling, his wife Kate, their friend Ororo who’s startling beauty could not be disguised by the hard life they were force to lead. And last but not least, Magnus, who although wheelchair bound had such a strength of will and purpose that it was impossible to think of him as an invalid. As the next few of years passed, Clark became more closely involved with the lives of his new friends, learning of their former identities as X-men, a group of mutants dedicated to protecting both mutants and the humans who feared and hated them. He also heard rumours of an underground resistance movement making raids on the camps and sentinel strongholds up near the Canadian Border. There was also word that the Sentinel were planning on expanding beyond the borders of the former US. Clark believes his friends are hiding something from him and follows Franklin to one of the Camp houses. Slipping inside and hiding, Clark watched as Kitty returns from a sanctioned trip outside the camp for medical supplies, but she has also brought something else, a small electonic component. Clark listens in awe as they talk of now being able to disable the inhibitor collars all mutants are forced to wear. But that is the least of what they intend to do. There is talk of time travel and altering reality, much of which goes over Clark’s head, but what does grab his attention is his first sight of a mutant using their natural powers uninhibited. As the group prepare, Rachel has Kate, relax on a mattress, and then begins to talk to her very softly, calmly. Rachel continues to whisper to Kate on and off for the next couple of hours as the rest of the group come and go, obviously preparing for something that is about to happen. It is at this a gruff voice behind him tells Clark, he needn’t hide in the shadows any more. Shocked that he has been spotted Clark literally falls out of his hiding place as a short stocky man with an odd accent steps into the light. “Logan” it seems has come to aid the former X-men’s escape. Unwilling to take Clark with them due to the dangerous nature of the task ahead, they persuade him to stay with magnus to cover up their escape. The group fade into the darkness of one of the service access tunnels. Later that night Magnus and Clark hear rumors of a failed attempt by a group of mutants to destroy the Sentinel Control Centre in the Baxter Building. All the mutants are dead. The shock news of his friends death triggers Clark’s mutant ability – teleportation – causing himself and Magnus to be flung nearly 100 miles outside the camp almost instantaneously The next four years are spent hiding, fighting and learning. Magnus teaches Clark both about leadership and also techniques to control his gift. Rechristened “Blink” because of his ability to move from one place to another in the blink of an eye, Clark has gathered a small band of similarly minded individuals around them all with one purpose – to end the reign of the Sentinel. Known superhuman powers: Blink possesses the ability to generate teleportation warps, allowing him to displace people and objects. His maximum range hasn’t yet been determined, although with his current level of expertise he can move his entire group instantaneously a distance approximately 500 miles. Blink can also manifest the energy portals in the form of discus shaped weapons, which cause their targets (or parts of their target) to teleport. This power can be used offensively and defensively. The effective range of these discus is approximately 200 metres. Additionally Blink carries adamantium darts (liberated during an early mission) which he can use over a much longer range. By throwing the dart, and instantly ‘blinking’ it, it can effectively hit its target with the same velocity it had upon leaving his hand. 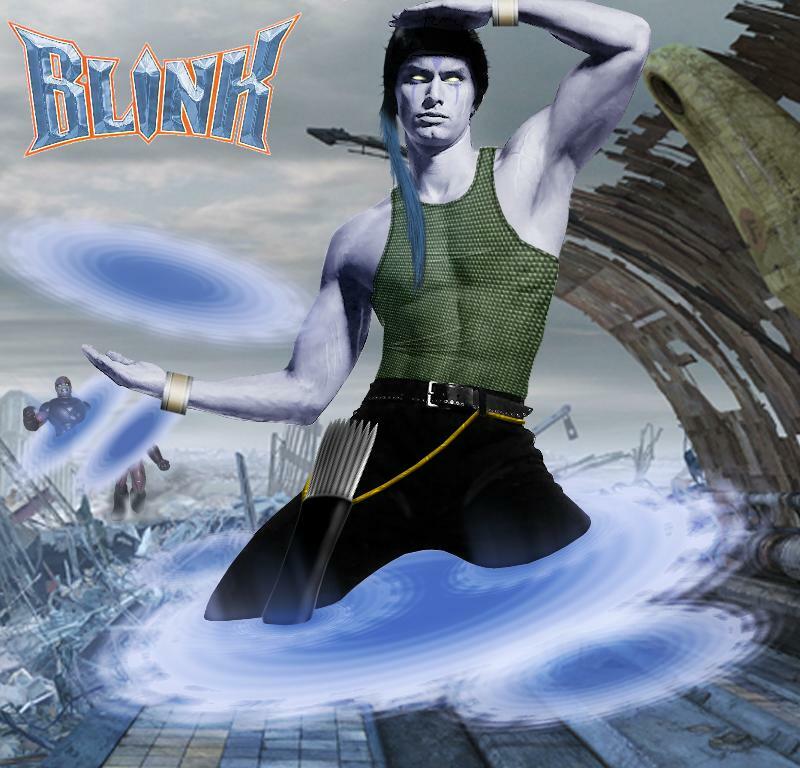 It is unclear as to how Blink targets the destination for teleportation, but he may have a subconcsious precognition which automatically retargets him before materialisation to prevent appearing inside a solid object. Well.. due to a pc crash I nearly lost this pic..which would have annoyed me greatly. Luckily I had saved a jpg version prior to the crash, meant I had lost all the layer info, but at least I had the pic. Anyways.. (I originally had this labelled as Penelope Cruz but it isn’t) here is Yamila Diaz Rahi as Elektra Nachios (in a Greg Horn style) applying for the post of ‘Loss Adjuster’ at Fisk Industries. Yamila originally had on this crocheted bathing suit style affair, so the first thing I did was a hell of a lot of smudging on the main body to get it looking smooth. I also smudged out the skin to give it a painted look. Removed the silvery shoes she was wearing. 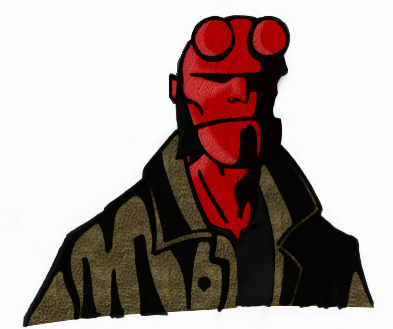 Recolored the eyes. Extended the bodice up over the shoulder. The straps on the hands and feet created using vector lines, then darkened using lassoo and HSL adjustment. Then used a small brush to smudge out some wrinkling. drop shadows added to each indivual strap to give that overlapping feel. Created the flappy bit of the dress using vectors, then used HSL again to give it some shading. The sais were created from scratch using Eyecandy’s chrome tool and again more HSL adjustments to give some additional shading. Used the sai’s to create a selection cut from the floor to add some reflected color. The shadows were done in a similar fashion, then deformed and blurred. Added the FISK logo, with drop shadow on multiply layers. 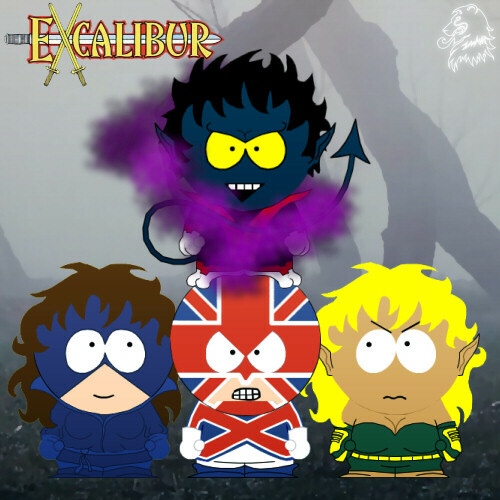 Well, I haven’t done one of these in ages.. and Essex said the gallery (DCG) was running a bit low on submissions.. so I proudly present.. in the South Park Stylee.. Kitty, Brian, Kurt & Megan.. better known as Shadowcat, Capt Britain, Nightcrawler.. and erm.. Megan;), collectively known as Excalibur. 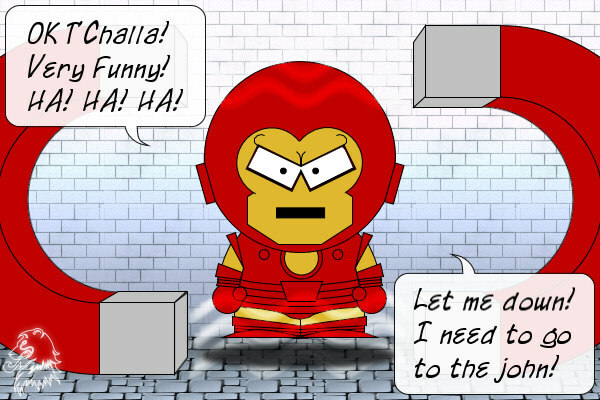 They are here about to access the Siege Perilous.. and enter *bom bom bom* the OmniPark… where all South Park universes meet. May I see your ID Miss? 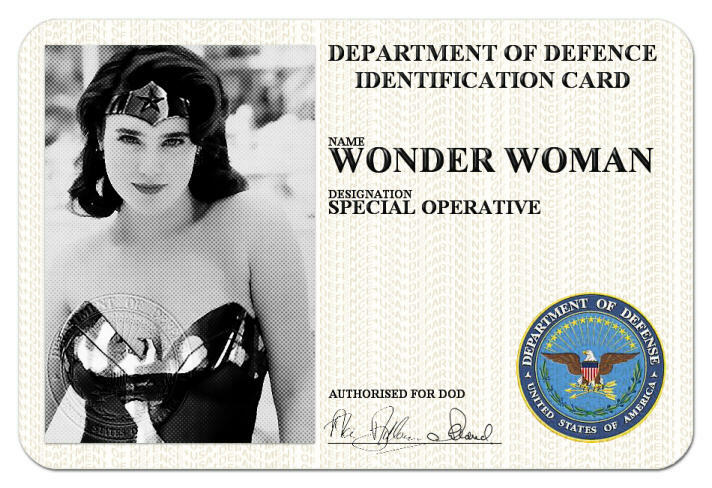 Well I was playing about with a quick Jennifer Connolly as Wonder Woman manip, and it came into my head that since she had all these dealings with Steve Trevor, Wonder Woman would probably have some sort of military clearance – and hence the idea for a DOD ID card..
Black and white photo of Jennifer, smoothed out the flowery bathing costume she had one and removed the straps. Found a decent Alex Ross pic of Wondy and grabbed those lovely metal’s he paints. Applied a halftone effect to this black and white image. The card was made up using a rounded selection to create a drop shadow/edge effect. The background text was created as normal and then used as a fill pattern. this filled layer was distorted using the wave filter and the excess cut off. The DOD embossed stamp over the picture, and the colored logo are from the DOD website (check it out they have various seals and logos available in multiple formats for download) The text was added and I used Eyecandy glass filter to give it a raised feel.